This is a picture of brothers Brad and Ted Shinkle. They just returned from their annual deer hunting trip to Crystal Falls in the Upper Peninsula. Brad will be 90 years old next year, and Ted is about two years behind him. 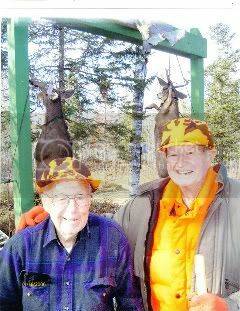 These two die hard deer hunters have been hunting the rugged U.P. for almost 60 years. Ted’s son Gary now owns the 80 acres their lovely log camp is located on, and he enjoys spending time with his dad and uncle at this time of year. Family friend Darryl Ansel spent some time with the Shinkle’s a few weeks ago bowhunting, along with his friend Randy Redmond. Darryl got a nice 8-point and Randy took a 6-point while at camp. Darryl said the deer numbers seem to be “up” over the last few years. The Shinkle’s are great host, and love to share their piece of paradise with family and friends. An evening with Brad and Ted at the poker table is worth the drive in itself! I’ve been fortunate enough to spend time with them on two different hunts, and my sides still hurt from laughing so much. It takes the better part of the week just to hear all the B.S. (I mean deer stories) these two have accumulated over the last 70, or so, years! At the young age of 85 Ted shot a 250 pound bleak bear not too far from camp. Darryl and I were both in camp when Ted dropped “ole blackie” with one shot. Brad and Ted have both taken deer in the last few years, and Brad even took a (huge deer with little horns) with his bow last year. I happened to see Gary a few days ago, and he shot a six pointer, but Brad and Ted came home empty handed. Ted had been seeing a nice 8-pointer around his bow stand, but wouldn’t you know he disappeared for gun season. Brad had a 6-pointer walk by his stand, but elected not to shoot it. Gary had to ask “WHY” “Brad would you let that nice buck walk?” To which Brad replied “I’m waiting for a big 10 pointer, and if I don’t get him this year I’ll get him next year!” That’s the way these guys think-there’s always next year! God Bless the Shinkle brothers. They are truly a credit to the sport of hunting, and the epitome of what deer hunting should be. If you want to know more about these two dyed-in-the-wool deer hunters read the Monroe Evening news story published on Nov. 28th. in the outdoor section. You can go online and read the whole article. 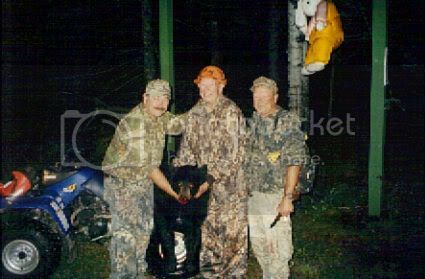 Below is Ted, Darryl and myself admiring Ted’s bear a few years ago. 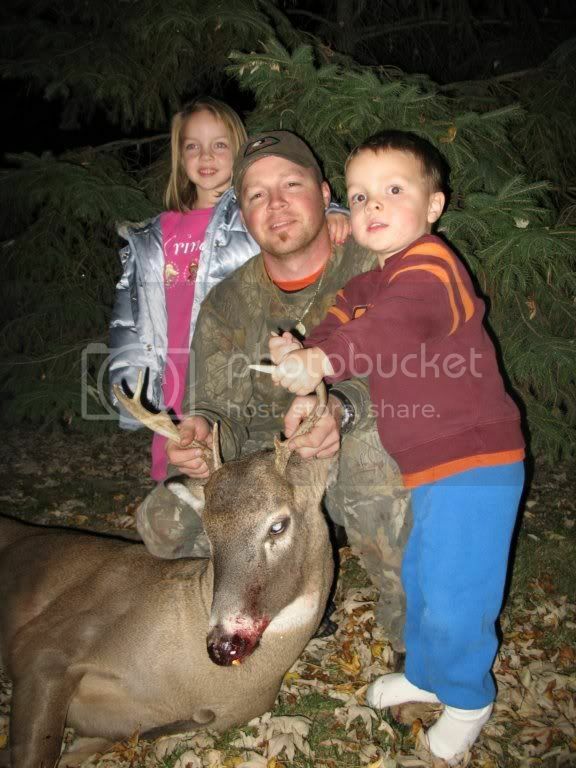 My nephew Derek is having a deer hunting year like no other! He filled his Michigan licenses harvesting a 6-pointer and a great 10-pointer, with his bow, and now check out this gorgeous Ohio buck he “laid to rest” this past Tuesday with his shotgun! What are you going to do for an encore son? Derek works, as a manager, at Cabala’s in Dundee Michigan, and can’t break away for hunting, like he would like! He has only sat on stand for five days this year, but has put three nice bucks in the freezer. His recent hunt, to Hocking Hills in Ohio, was a two day deal that paid off big time. My brother Darryl and his friend Dan Graham arrived at camp on Friday, and were going to meet up with Derek for gun opener. 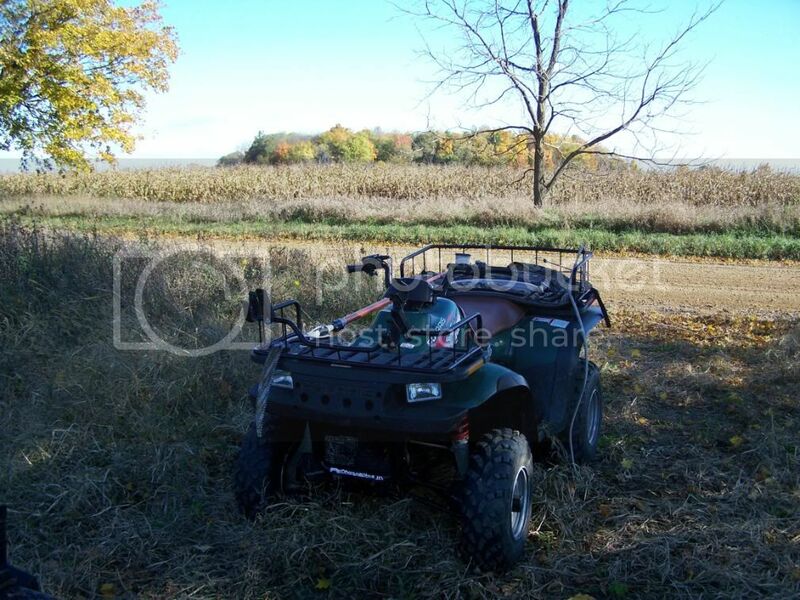 Darryl’s friend Jason has approximately 1000 acres that he and his Ohio buddies hunt. They sit till 9:00 A.M. on opening day, and then start driving for deer. The area they drive is very hilly, and this type of hunting is not for the faint of heart. Well Jason asked Derek if he wanted to get in on the drives, and Derek jumped at the chance. Darryl and Dan opted to hunt a farm where they had been seeing some monster bucks. Opening morning Jason placed Derek on a ridge about 300 yards up the side of a hill. The plan was to meet at 9:00 o’clock and start driving. Derek said at around 8:30 he decided to move down into the valley and watch a small funnel, just in case the other guys ran a deer his way. Don’t you just love it when a plan comes together? Sure enough; the other hunters ran this beautiful, symetrical 10-point within 60 yards of Derek’s position, and he anchored it with a heart shot! The buck will score somewhere between 140-150, with hardly any deductions. After Derek took care of his deer he helped the other hunters drive the hills and woodlots. Before the day was over two young bucks and two nice 8-points were added to the game pole. Not bad for one day of hunting! Congratulations again Derek you’ve had quite a year! This is a great example of a nice mature buck. It was taken by Tom Hedke from Grand Rapids, who used to live in Gibraltar Michigan. This deer was taken on public land in the state of Illinois several weeks ago. Tom says the hunting is phenomenal, and it is not unusual to harvest 130 and up bucks. 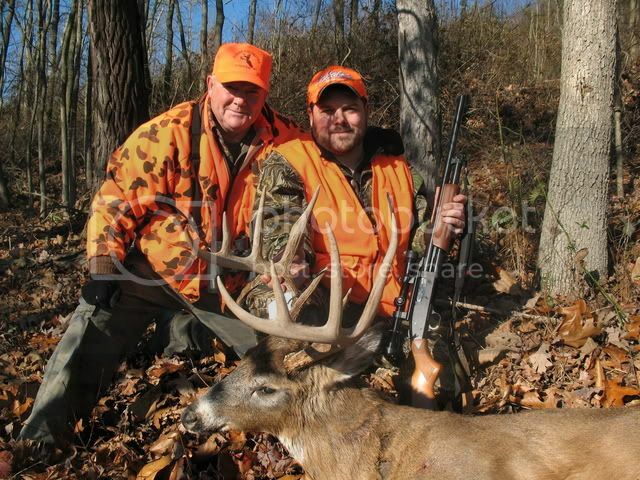 This 10-point� scored 148 pope and young inches, and Tom says he saw one that would of easily went over 220! Tom shoots a Bow-Tech Guardian, which he loves, and used a 2-blade “rage” broadhead. The deer moved, just as Tom released, causing the arrow to enter the neck and exit the left lung. The deer only traveled 60 yards before piling up. This is not Tom’s first big buck, as he downed a huge 160-class whitetail, not far from his Grand Rapids home. Tom still hunts Michigan, when he can get away from his job, but his focus is on his buddies Illinois public land hot-spot for now. With results like this who can blame him? Toms son Zechariah is pictured with him, and the look on his face says it all. Congratulation on a fine buck Tom. Little House of Hugs� Daycare During the fall months, and especially around Thanksgiving. 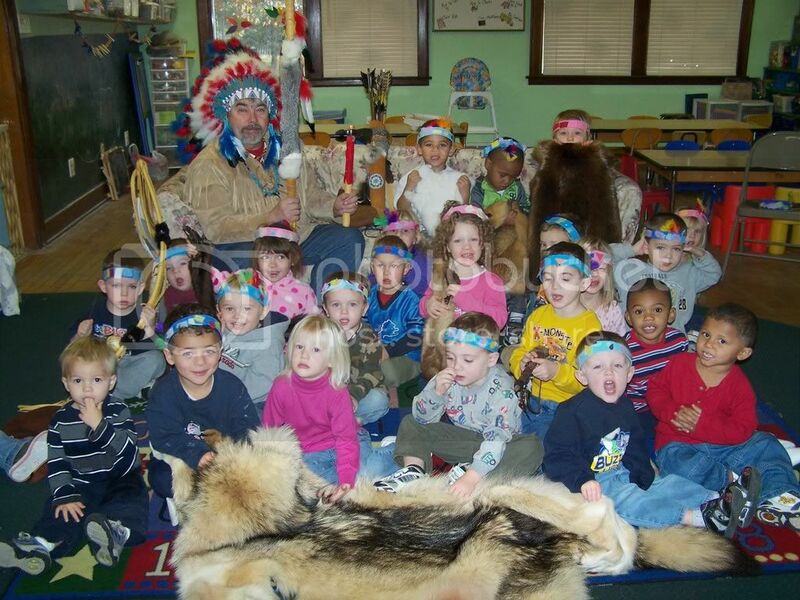 I go to daycares and schools and give a presentation on Native Americans. I go by the name of “Chief Ten Bears!” My mother is from Canada, and her great grandmother was a Cree Indian. The linage gets pretty watered down by the time it gets to me, but it may explain my love for hunting and the outdoors experience. Most of what I bring with me to “show and tell” is a reproduction that I have made ie. quivers, arrows, pipes, lances, tomahawks, talking sticks, and various decorative items. I always bring my collection of animal hides including deer, beaver, rabbit, fox, mink, skunk, and wolf. I have a lot of fun with the skunk, but the hide from a 150 pound Quebec wolf, always impresses the kids. It’s a hands on experience for them, Arrowheads, bearclaw necklaces, trade beads, leather pouches. Bowie knives, and water containers (dried out gourds,) a deer hide shirt, and a full head-dress round out my display. 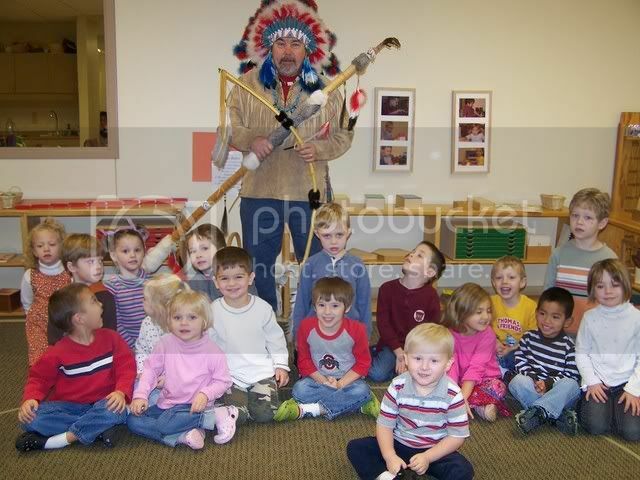 I try to teach them a few Indian words during my presentation, and never have a problem keeping their attention. I talk about hunting, and the importance it has always played in our history as a nation. Over the last week and a half I have had the honor to give four demonstrations to boys and girls from various backgrounds. Hopefully I am planting some good seed that will help strengthen this nations outdoor/hunting traditions. This is Kim’s Kountry Smoke House located at 14197 S. Telegraph Road in LaSalle Michigan. Owners Jeff and Kim Davis have been at this location for over a year, and word is getting out about the quality operation they run. Kim’s has a full deli with specialty meats, homemade jerky, cold beverages, panini sandwiches, stocked items (chips, seasonings, batters, ect.,) and custom deer processing. Last year I took two deer there myself, and Kim’s did a fantastic job of processing my deer. I had some sausage and jerky made, which was excellent. The “skinnin and grinnin” crew even vacuum wraps your various cuts of venison. These guys processed over 400 deer last year, and are looking to do even more this year! You’ll enjoy the friendly atmosphere, and the different taxidermy mounts hanging from the log interior. There are “big bucks,” turkey, coyote, bobcat, caribou, fish, and even a huge grizzly just to name a few. The landscaping is first rate, and Kim’s Christmas tree lights are worth the drive in itself. There is plenty of paved parking with easy entrance and exit onto Telegraph road. 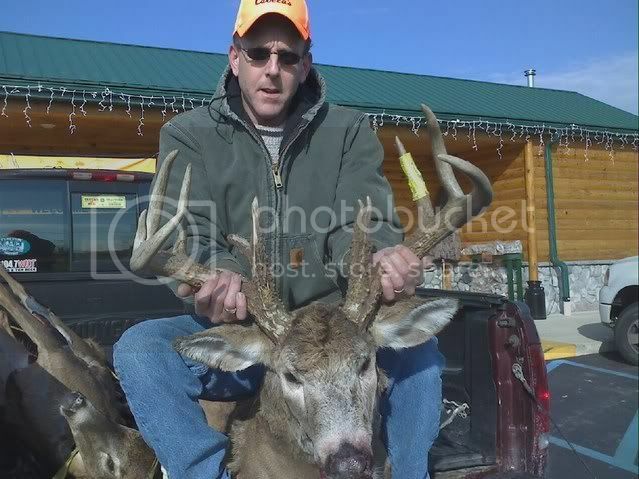 This is a picture of Scott Smiley and his Monroe County 8-pointer. It’s his 1st. 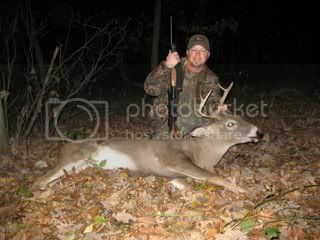 buck in ten (10) years of hunting. Congratulations Scott! Scott has been hunting the last few years with his father-in-law Darryl Ansel (my little brother) which increases his chances 10-fold of finding deer. Darryl is a deer “magnet” and is probably one of the most knowledgeable veteran deer hunters around these parts. That being said -here is Scott’s story. Opening day came up a big fat zero for Darryl and Scott, as did Friday morning. Darryl had to pick up one of the grandkids in the afternoon, so Scott went out earlier than normal. He set a feeding doe decoy in the field, next to the woods, and plunked down under a big oak tree. Within 5-minutes a yearling button buck and doe started, cautiously, milling around the decoy. The wind was in Scott’s favor,so the two young deer stayed in the area for an hour and a half. At 20 minutes after five the young buck lifted his head and stared toward the woods. Scott saw movement, as the 8-pointer strutted out in the open to investigate these two upstarts, and the “feeding” doe they were with. At this point the deer was just over 100 yards away, and Scott asked the Lord just to let him get a shot at this nice buck-before he had a heart attack! On command the deer confidently walked closer to Scott’s position. With his trusty shotgun perched on his left knee Scott ask for Divine help to steady his nerves. The buck is now squarely in the center of Scott’s scope, and grazing by the decoy. Scott slowly and methodically pulls the trigger! The buck reels backwards, and makes a dash toward the woods. Scott is so excited he calls his wife Jodee on his cell phone-which dies as they rejoice together! As Scott walks to collect his decoy he can see the white underbelly of the deer, just 15 yards into the woods. Scott put the slug squarely in the center of the front leg crease, which resulted in a perfect heart/lung shot. Scott is so elated he almost leaves his “lunch” in the woods! “Oh Happy Day” kept going over and over in Scott’s mind. Scott’s buck had a couple broken tines, but a true “trophy” if ever there was one. Looks like that father-in-law is starting to “rub” off on you young man. Be careful cause they’ll come in bunches now!!! Scott is pictured below with two of his kids Makaylee and Caleb.� Scott and Jodee’s first born Kyler is with Jesus in heaven. Paul Yentz will never forget November 17th. of 2007! He shot, what may turn out to be the largest racked buck ever taken in Monroe county, and maybe even in the entire state! Paul’s 14 point behemoth has astounding 7 inch bases, along with a near 20 inch inside spread. Officials at Cabala’s estimated the deer will score between 170-190 Boone and Crockett inches. The buck is a mainframe 10 pointer with split brow tines and a couple “kickers.” The “mass on this “bad-boy” is really impressive. 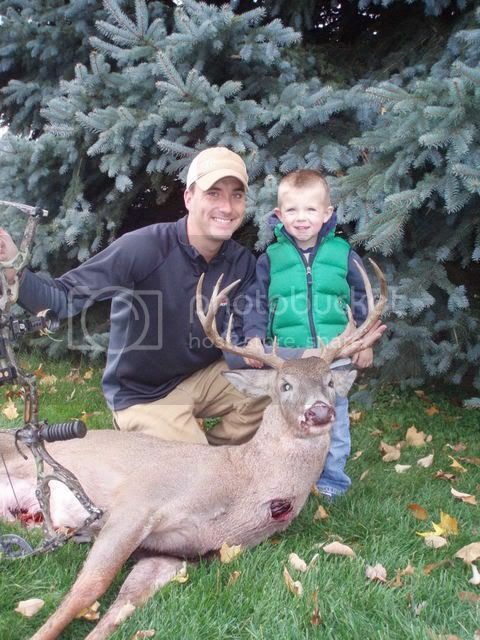 Paul’s story of how he downed this 4-1/2 year old giant is almost as incredible as the deer itself! 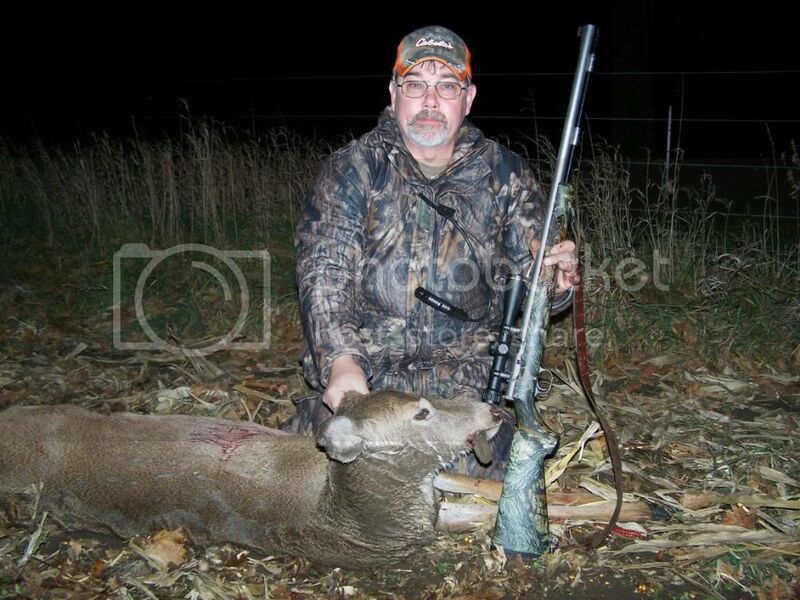 Paul has hunted on family property in Dundee Michigan for many years, and has taken 16 deer off the property. Seven years ago he shot a huge 11-pointer, and thought he would never “top” that deer. Paul was wrong-very wrong! By all accounts he probably has truly taken “the buck of a lifetime,” with his current 14-pointer. Prior to opening day, Paul had done no scouting, and had not shot his Remington model 1100 since he got his sights fixed. As Paul climbed into his ladder stand opening morning his trusty sidekick slid off the platform between the top two steps. As Paul retrieved the shotgun his dad had given him he noticed both sights were knocked off the barrel. Paul wanted to scream-in fact he did scream, so loud that his hunting partner Tom heard him! Paul always carries a couple of buckshot, so he loaded up the 1100 with the few he had. Around 10:00 o’clock he dropped a 4-pointer at 45 yards with the double 00 BB’s. Paul didn’t have time to get the sights fixed so he bought some more buckshot, and continued to hunt. Saturday found Paul in his stand again watching a fat doe feed toward him. He had a doe permit, but he was content just to watch the doe, and enjoy his surroundings. It’s a good thing, because the “monster” 14-point was “trailing” the doe. Paul cut loose at 55 yards, and watched as the deer reacted to the blast. Paul knew he was hit, as he ran only a short distance, and Paul fired again. The buck piled up almost exactly where he was originally standing. It took Paul several minutes to calm down after he laid eyes on his trophy deer. Paul took the deer to Kim’s Kountry Smoke House to have it processed, and owner Jeff Davis found a broadhead buried in the shoulder. He said the wound had healed quite well, but there has to be one disappointed archer out there! All I can say Paul is that “some things are just meant to be!” Congratulations on taking one of the best looking bucks this “old hunter” has ever seen. Are you going to fix your sights now? 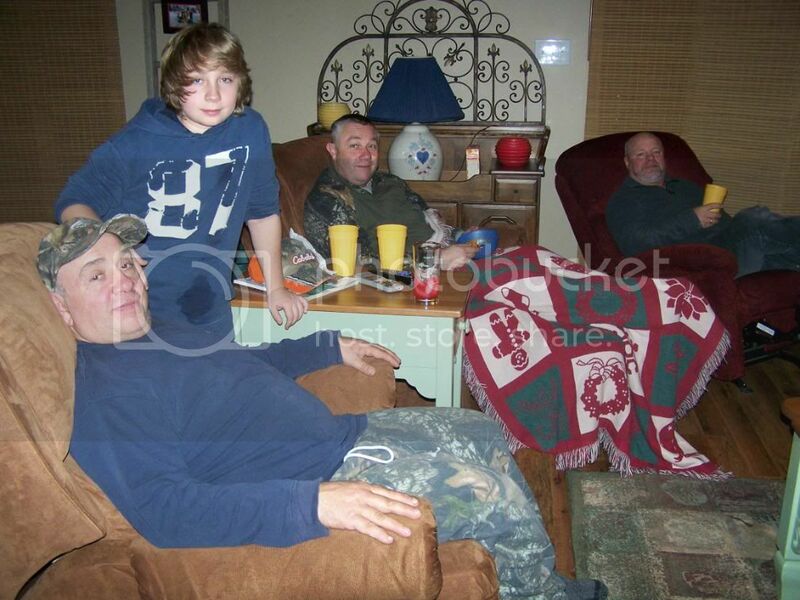 This is part of our hunting crew at my brother Brett’s place on Lake Diane. Even though we hunt in a few different areas; we meet up for a “hunting camp ” meal at Brett’s. Pictured is son-in-law Tony, grandson Quinn, brother Brett, and friend Mike Heil. Each of us brings something for the meal, and what deer camp doesn’t have at least one chili dinner? This year my daughter Alena made our chili, and I think it was the best “camp chili” I’ve ever had. My daughter uses a lot of meat (venison) along with her own stewed tomatoes. She browns onion and green pepper, and uses both chili beans and kidney beans. As an added touch she dices up potatoes and adds them to the pot. She then seasons with chili powder, garlic salt, regular salt, and pepper. We had a great salad, along with oven warmed garlic bread, to compliment the chili. The deer stories were few and far between this year, but I recently saw a picture of a 15 point Monroe County buck and it’s a “bruiser!” Once I get more information I’ll try and do a story on the deer and the fortunate hunter. Yesterday (Saturday) when I came home from Hillsdale I left my friend Mike Heil standing here looking at the biggest set of deer tracks either of us have ever seen. Several had crossed in this very spot, and the “big boys” hoof prints were at least 1/2″ deeper in the ground than the rest of the tracks! Not only that; the length and width of them were huge. Were talking 300 pound deer here! Mike asked me if I was sure I wanted to continue on toward home, and believe me I wanted to stay, but I couldn’t change a prior commitment. The corn you see in this picture was finally being harvested, and the deer’s hiding place was disappearing. I’m sure the farmer was chasing deer over to my side of the woods. Even though it was raining and snowing Mike was eager to take a stand in the trees. Not exactly the big 8-10 point I was looking for, but this doe will put a few pounds of venison back in my empty freezer. The deer were really spotty this year, as the old stand by places didn’t pay off as in years past. We never took a deer off the property where I shot two last year, and saw very few on the new 160 acres I leased. There seemed to be alot of shooting around us, but we weren’t in the “right” place at the “right” time! I came home today, but dropped Mike off at the property, and there were fresh tracks all over our cut cornfield. The farmer across the road was cutting his corn, and the deer were looking for a place to hide. Thursday evening, when I shot the doe, I saw three others with it. They were “carrying the mail” and it didn’t look like I was going to get a shot. I grabbed my muzzle-loader and followed them through the thick brush with my scope. The biggest one stopped about 60 yards out, and I anchored her with a heart/lung shot. I don’t know how, but she still ran about 80 yards before piling up! On my way out to get the 4-wheeler I jumped two more in our fence row, but couldn’t tell what they were. That same evening Mike missed a forkhorn, and Tony and Quinn didn’t see anything. My brother Brett has been skunked so far, but my nephew Scott Smiley shot his first buck (8-point.) Brother Randy took a 4-point in the U.P. and I’m still waiting to hear from the rest of the crew. There was a beautiful typical 16 pointer at the Addison deer locker, and I saw two really nice bucks on my way home.